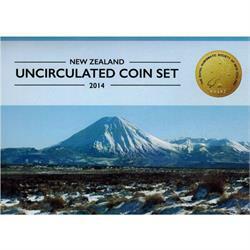 The last official uncirculated coin set issued by the Reserve Bank of New Zealand was released in 2013. Since then, only official proof sets have been released annually. However, starting in 2016, the Royal Numismatic Society of New Zealand is attempting to cover this shortfall by issuing sets for 2014, 2015 and 2016, and thereafter as long as coins are minted and released into circulation. The release of the coins into circulation can be slow and the 2015 set is not expected until 2017. For 2014 only 300 sets have been issued. Each set contains four of the five New Zealand circulating coins - the $2, 50 cent, 20 cent and 10 cents - as there were no $1 coins minted in 2014. These collector's sets are issued with the support of the Reserve Bank and great effort has been made to maintain the style and format of the sets produced until 2013.